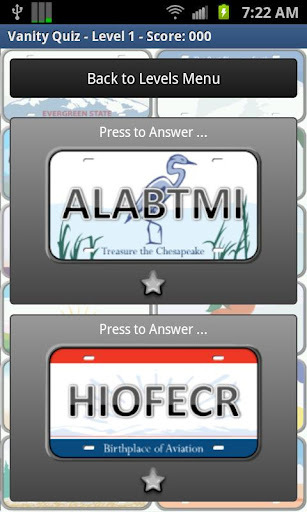 Swarm Blog: Test Your Car License Plate Knowledge with Vanity Quiz Game for Android! 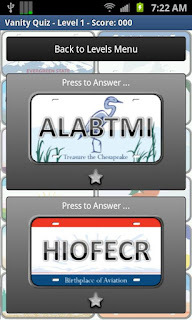 Test Your Car License Plate Knowledge with Vanity Quiz Game for Android! How well do you think you can identify various vanities (car lisence plates)? Test your knowledge in this free Vanity Quiz Game by developer Mobile Mindlessness for Android! With 100 vanities spanning across 5 levels, you're sure to be entertained for quite a while! Compare your answers with friends or challenge them to see who can properly identify the most plates. There are also a number of different modes and bonuses to unlock. In Normal Mode, there are 3 levels and 60 vanities which require players to earn points and unlock further levels. There are also 2 different bonus levels containing 40 more vanities that players can unlock via in-app purchase. No matter what you do, you can work your way up to the top of the global leaderboards (powered by the Swarm gaming network)! These leaderboards offer a fun, social element and make the game much more engaging. Want even more fun? Developer Mobile Mindlessness is committed to bringing new vanities and new levels to the game soon. Download the Vanity Quiz Android game from the Google Play Store for free today and enjoy hours of quiz time fun for days to come!